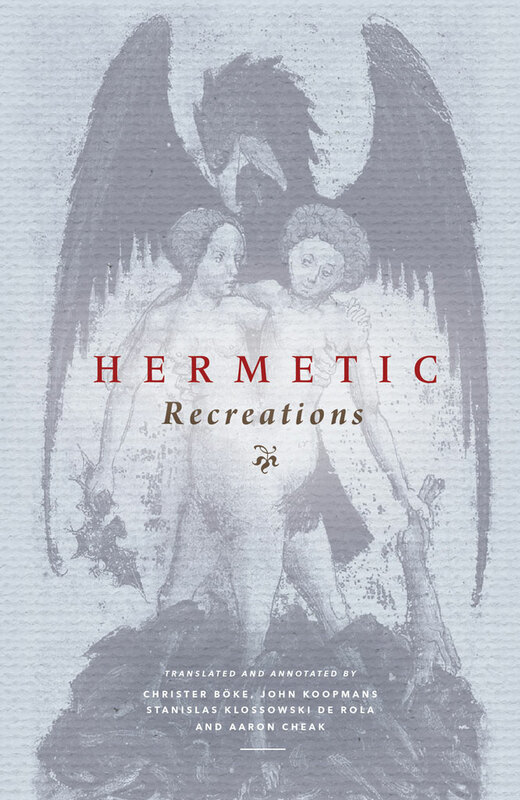 TRANSLATED into English for the very first time, the Hermetic Recreations is a uniquely lucid masterwork of French Hermetic philosophy. Set down in an anonymous hand at the turn of the Nineteenth Century, it provides critical insights into the operative arts of the western alchemical tradition. Illuminating both the traditional mediæval practices of which it was the inheritor, and those of the Parisian alchemical revival that would succeed it, this rare text forms an influential bridge between two alchemical epochs. Hardcover | 5.5 x 8.5 | B&W | 152 pp. “Life, such as we wish to consider it, is but a struggle between two substances, or a continual exchange of light and darkness. One of these substances alternatively takes the place of the other, sometimes taking the male function and sometimes the female. And in a manner pleasing to the divine author, everything either changes into a pure light, or returns to the Cimmerian darkness, which shows that light and darkness are but one and the same thing, changing in form and value by the expansion or contraction of the substance”. Although the identity of the author remains a mystery, the text appears to have been composed sometime between the late 18th and early 19th centuries. Preserved in the manuscript collection of Muséum d’Histoire Naturelle in Paris, it was first brought to the attention of Bernard Husson by his friend, Eugène Canseliet (1899–1982), a French alchemist and the only direct student of Fulcanelli. This eventually resulted in the first publication of Les Récréations hermétiques in 1964. Gilles Pasquier published a corrected edition in 1992, also in French, which included the Scholium or commentary. The text of the Scholium is a particularly revealing addition, for it presents 150 Hermetic “aphorisms” encapsulating the core principles of the alchemical process. 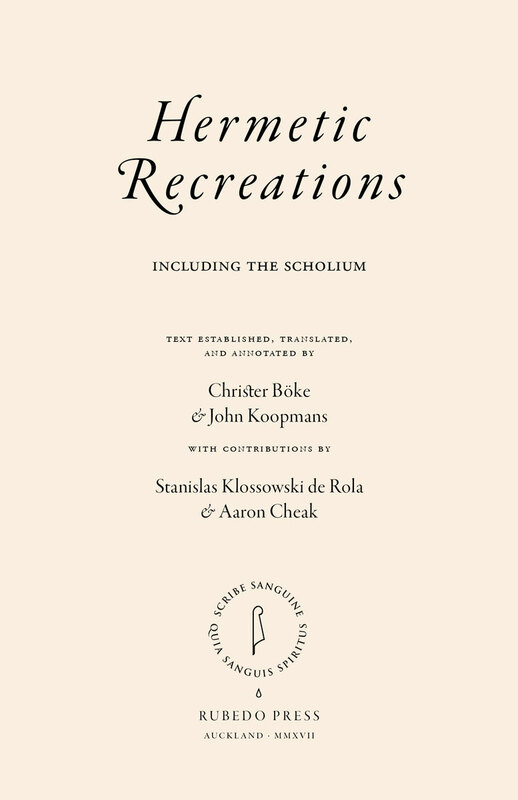 Both texts, which clearly form a single work, are presented here in a handsome dual language edition, in French and in English, with copious scholarly annotations by Christer Böke, John Koopmans, Stanislas Klossowski de Rola, and Aaron Cheak. Christer Böke (MA, History and Theology) has been researching the history of alchemy for the past two decades. 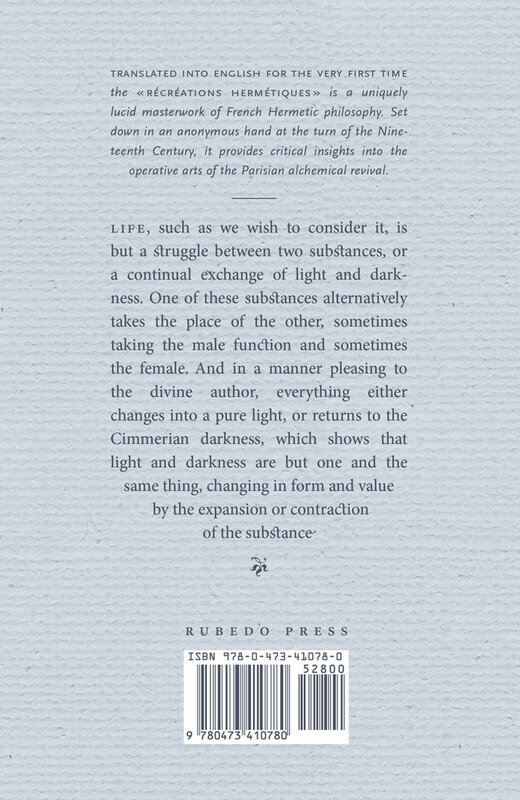 His major interest lies in reconstructing alchemical theories from an experimental perspective. Christer wrote his Masters thesis (Lund, 2002) on the ‘Paracelsus dispute’ (1707–1708) between the swedish chymists, Urban Hjärne and Magnus Gabriel von Block, triggered by the infamous Paykull affair—a topic he further covered during ‘On the Fringes of Alchemy’, an alchemical workshop held with different scholars in Budapest 2010. Christer participated in the Swedish translation and commentary of Fulcanelli’s Le Mystère des Cathédrales (Katedralernas mysterium, 2013), featured in the documentary Alkemistens År: The Great Work (2013), and acted as a peer-reviewer on Carl-Michael Edenborg’s alchemical fiction drama, Alkemistens dotter (2014). John Koopmans (BA, Hons, Geography) is a retired professional demographer. Over the years, he has collaborated in, or contributed to, a number of books concerning biblical history, and the historical study of Grail lore. When he’s not intensely studying Alchemy, or transcribing numerous old alchemical texts (many in original handwriting), he continues to maintain a very long, active interest in various studies, including recent and ancient history (civilisations, archæology, religions, sciences, philosophies, esoterica, and mythologies). Prince Stanislas Klossowski de Rola (Baron de Watteville) inspired a reevaluation of the alchemical tradition with his two books, Alchemy: The Secret Art (1973) and The Golden Game (1988), and their French elaborations, Alchimie ; florilège de l’art secret (1974), and Le Jeu d’or (1997). Son of Balthus, the renowned Polish-French aristocrat and artist, Stanislas is a man of unique extraction and influence. A close personal friend to Eugène Canseliet—the direct disciple of the legendary adept, Fulcanelli—he more famously befriended The Beatles and The Rolling Stones in the 1960s, and gained popular attention for his dandyist æsthetic. He later lived for many years in Sri Lanka, and was personally acquainted with Lama Anagarika Govinda, an important authority on the deeper links between eastern and western wisdom traditions. He presently resides in the Castello di Montecalvello, Italy. Aaron Cheak, PhD, is a scholar of comparative religion, philosophy, and esotericism. In 2011, he received his doctorate in religious studies for his work on French Hermetic philosopher, René Schwaller de Lubicz, and from 2013–2015 served as president of the international Jean Gebser Society. Founder and director of Rubedo Press, he has appeared in a range of academic and esoteric publications, including Alchemical Traditions (2013), Clavis (2014), Diaphany (2015), Lux in Tenebris (2016) and The Leaf of Immortality (2017). He currently lives on the west coast of New Zealand, where he maintains an active interest in tea, wine, poetry, typography, and alchemy.